Your child just turned 3 or 4 years old, and now you’ve come to the popular question of: “Preschool or No Preschool?” You may have talked to other parents about what worked for their child, you may have read articles about why you should choose preschool, or you may be on the fence about what will work best for your child and still be feeling unsure. You may be wondering if your child really needs preschool, will they benefit from it, how much it will cost you, what happens if they don’t like it. These swirling questions can make the decision even harder. 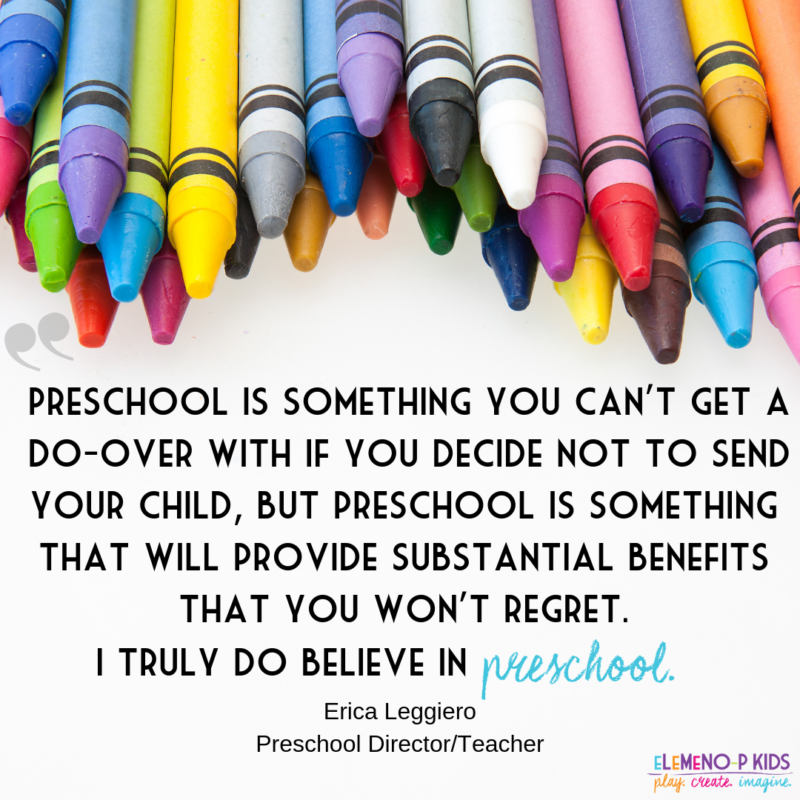 Deciding whether or not to send your child to preschool can be a difficult choice. That’s why I’ve come up with some pros and cons to hopefully make your decision a little bit easier. *Disclaimer: Before we start, let me just tell you that I come from a pro-preschool point of view. I’ve taught preschool non-consistently for over 8 years. I am currently in my 4th year of teaching preschool/pre-k and I’ve seen firsthand the growth that comes from being in a good, quality preschool. However, I do understand and am aware of the reasons people don’t want to do preschool, and I’ll do my best addressing those, too. You’re right. Preschool isn’t cheap. I know some preschools that charge more than my monthly mortgage. Prices can vary radically depending on where you live and what kind of program you choose. If preschool will be a financial burden, try looking for preschool co-ops in your area, your local YMCA, or Head Start. You could also contact your county to find out if they offer a childcare referral/voucher program. This one is common. Society makes us think that if our child already knows their letters, numbers, colors, and shapes by the time they are preschool age, they are already ahead of their peers and don’t need preschool. Preschool offers so much more than the standard 3-4 year old academics. 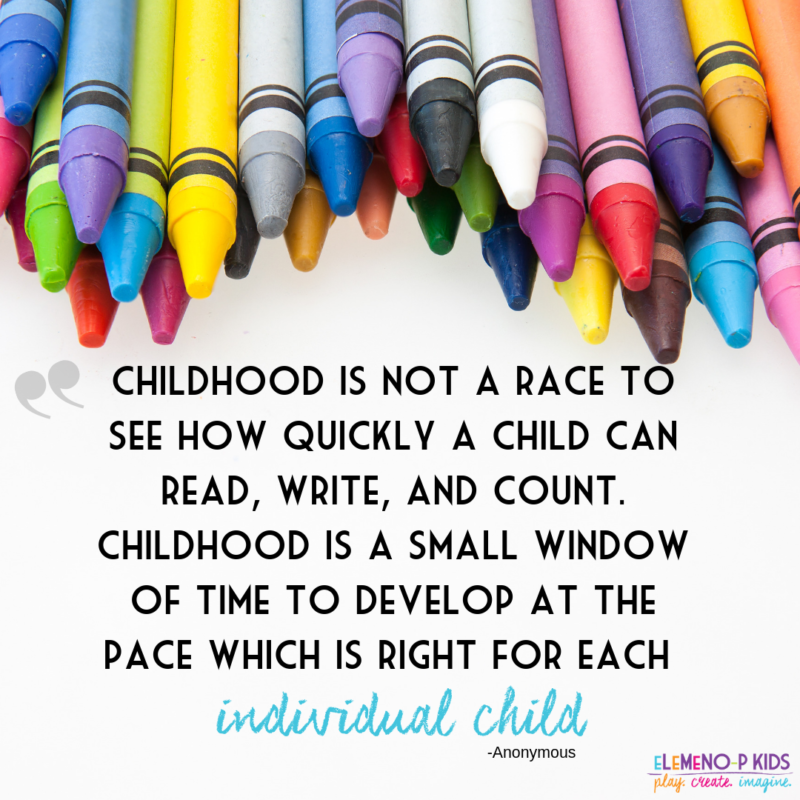 An anonymous quote states it best, “Childhood is not a race to see how quickly a child can read, write, and count. Childhood is a small window of time to develop at the pace which is right for each individual child.” You’ll find out more in the pros section. I know, you’d rather sleep in. Trust me, I get it. Preschool can put demands on your schedule that you may not be ready for until your child goes to “real school”. Some schools are half day making it difficult to pick them up, or feed them a good lunch before they go. Some schools are everyday, some are a few days a week. Don’t let this deter you. Find a school that’s flexible to fit what works best for your schedule. Ouch, as a teacher, this one hurts. Preschool may not catapult your child to valedictorian status or gifted Kindergarten classes because after all, preschool isn’t magic. But it will absolutely set your child up for success in ways that kids who don’t get preschool may not have. Let’s talk more about this in the pros section. Now that we’ve covered the cons and negative feelings toward preschool, let’s uncover some of the (in my humble opinion) beautiful things preschool can do for your child. You don’t want your child to get to Kindergarten and when his teacher says to line up, he has no idea what that means. Trust me, it happens! Your child may have never had a reason to line up or wait his turn. At the core, preschool teaches your child fundamentals for regular school like: lining up, playing with other children, listening and learning, self-sufficiency, following classroom expectations. Preschool is an easy way to bridge the gap between home and big school. Preschool helps your child feel secure in an environment that is stable and nurturing with a routine, much like Kindergarten and beyond will be. Preschoolers are expected to take care of their belongings and needs. They are asked to hang up their coats and backpacks, pick up their toys when finished, wash hands before snack, use the bathroom on their own, wipe their own noses-the list goes on. As kids learn that they are capable of tending to their own needs, they learn to do more and more things on their own. In my own particular classroom, my 3 and 4 year olds are taught manners, even as simple as “Yes, please” if they want snack or “No, thank you” if they don’t. It’s surprising how many of them consistently use these manners daily. They are expected to share, take turns, ask if they may please be next to use a specific toy or art supply. There is absolutely nothing wrong with being a polite preschooler and human. Sometimes children don’t get enough social exposure that allows them to develop conflict resolution skills. When out with a parent, if there is a 3 or 4 year old conflict, the parent steps in. In a classroom, your child is making friends and learning to get along with them, but most importantly express themselves in healthy ways without the over-supervision of a teacher or adult. I teach my students to tell their friends when they don’t like something that friend is doing, ie: hitting, not sharing, etc. I step in only when it’s unresolved on it’s own, which is less than 10% of the time. You’d be surprised at how quickly children learn to interact with their peers and resolve conflict. I purposely put this last on the list because it’s not the biggest pro of preschool. In my classroom, we operate a play-based curriculum and the “academics” are built in to play. There are no worksheets or flashcards. Rather we play games during circle time. We make writing fun by offering fun things to write on, such as a pumpkin or piece of foil. Lots of stories are read. We sing lots of songs that help us count. My students are exposed to the alphabet and numbers just in our environment, there are no letters of the week, or rote memorization. High-quality preschool can impact school readiness, early literacy, and early math skills, by just simply exposing your child to these things more than a buys at-home environment can. I know that I shared quite a bit of information with you here. 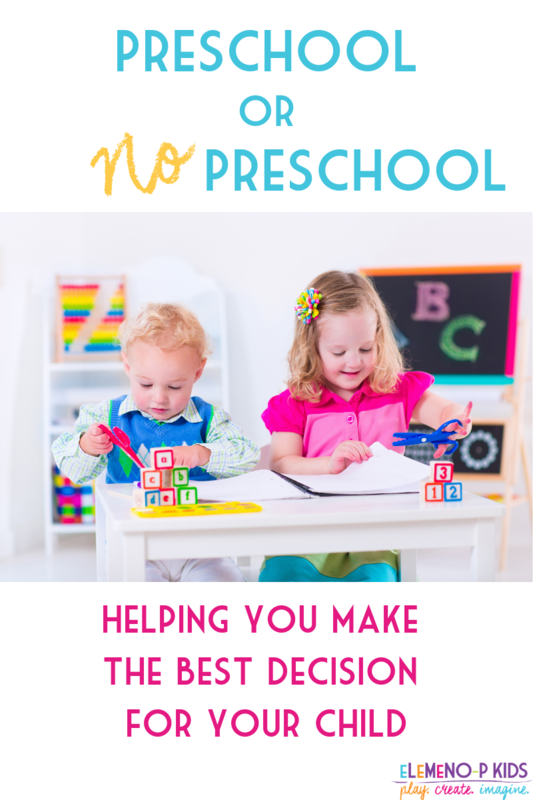 My hope is that it helps you make your decision about preschool a little bit easier. Your preschooler will reap the benefits by hanging out with their peers in a setting where they are free to be 3 and 4 year olds. Preschool is something you can’t get a do-over with if you decide not to send your child, but preschool is something that will provide substantial benefits that you won’t regret. I truly do believe in preschool.